Don’t you just love the pretty marbled cover and end papers they used to use when binding books? Instead of pictures that represent the contents of the book or photos of the authors, it used to be books were covered in leather or printed patterns. 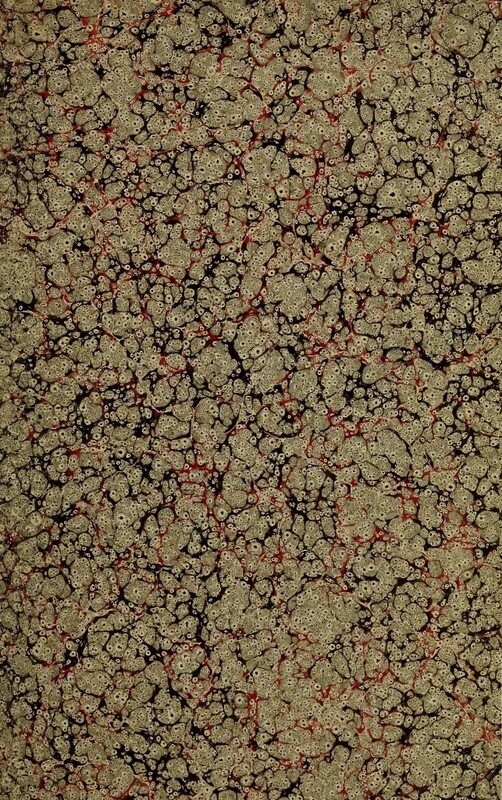 This beige, red and black background was used as endpaper in a book from the 1820s. The book was on botany and it this beige, red and black background reminds me of one of those slides from biology class of some sort of germ or organism in a petri dish. This wallpaper is not a repeating pattern but with some clever editing work, you could turn it into one. That said, this is such a big image that I’m not sure you would ever need to. It would probably use way too much ink to print and use as a scrapbook page background but I think it would be a great frame or background for a digital project. The image shown here is smaller than the original to help keep down the overhead of running Reusable Art. Clicking on the image will bring up a larger version that you can download and use for your projects.